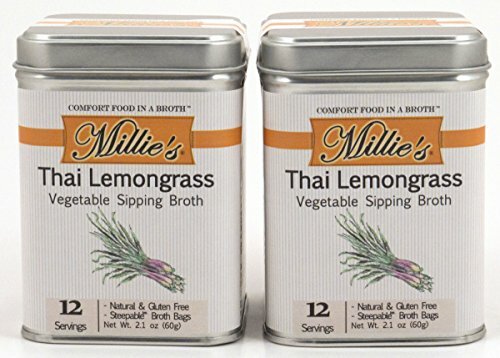 Thai Lemongrass Sipping Broth is a citrusy blend of lemongrass, spices & green tea, and comes in a classic shaped metal tin. This first-of-its-kind savory hot beverage delivers an amazing taste using the highest quality vegan, natural, wild harvest, organic and gluten-free ingredients with no added MSG. This Comfort Food in a Broth is an excellent alternative to traditional tea or coffee. Just boil water, pour into cup, add bag, and let steep. Longer steeping results in more intense flavor. Made in Washington, USA. Nutrition Facts Serv. Size: 1 packet Amount Per Serving: Calories 15, Fat Cal 0 Total Fat 0g (0% DV), Sat Fat .0g (0% DV), Trans Fat 0g ,Cholest. 0mg (0% DV), Sodium 260mg (11% DV)Total Carb. 0g (0% DV), Fiber 0g (0% DV), Sugars 0g (0%DV), Protein 0g (0% DV), Vitamin A (0% DV), Vitamin C (0% DV) Calcium (0% DV), Iron (0% DV) Percent Daily Values (DV) are based on a 2,000 calorie diet. If you have any questions about this product by Millie's, contact us by completing and submitting the form below. If you are looking for a specif part number, please include it with your message.